This year marks the 160th anniversary of the 1848 completion of the High Bridge. With last year’s Earth Day announcement by Mayor Bloomberg that the city will fund the bridge’s restoration and reopening as part of its PlaNYC 2030, there is now true cause for celebration. An interesting sidelight of High Bridge history is the jet of water that on occasion shot up from the Harlem River during the years of the bridge’s construction. The Croton Aqueduct opened in 1842; it was another six years until the bridge was completed. In the intervening years, Croton water was carried to Manhattan Island through a 36-inch low-level pipe laid across the river. The water descended on the mainland side and then ascended on the Manhattan side through a 120-foot-deep inverted siphon. The pressurized water, entirely gravity-fed, could be released as a jet, or fountain, upstream from the pipe crossing. 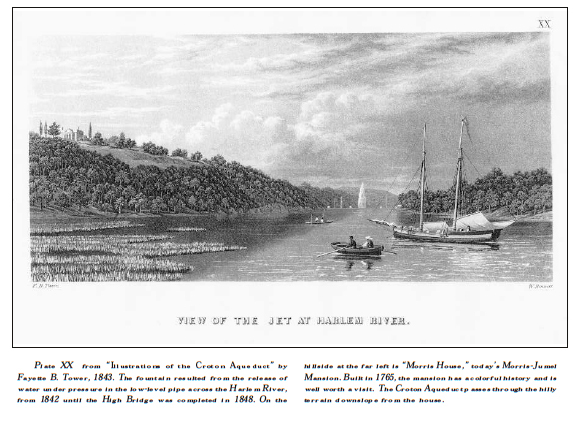 According to Aqueduct historian Robert Kornfeld, Jr., the engineers would “play” the waters of the jet to varying effects, to the delight of High Bridge tourists. Ever practical, John Jervis, Chief Engineer of the Aqueduct, in 1848 had the low pipe dismantled and moved onto the High Bridge, where it served permanently as one of the two original 36-inch pipes carrying Croton water across the river.